Download a Manifestation Mandala today! 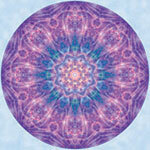 Energy mandalas are special 10"x10" symbolic digital art pieces created by me with the intent to assist others. They can be used in healing and manifestation work, or just to lift your spirits. 1. Gaze at the mandala while you focus on what you desire to manifest and feel your energy lift. Imagine yourself in the center of this mandala with the surrounding energy pouring into you and fueling your manifestation. The resulting excited energy can help you bring about what you desire. 2. Print the Manifestation Mandala out and post them around your home, to remind yourself of what you are working on, be it manifesting a new house, healing yourself, spiritual discovery, etc. Note: You will need to resize them if you don't have the capability to print on 11"x14" paper. 3. Use them as wallpaper on your computer, and every time that you look at your the picture on your desktop, remember what you are focusing on manifesting. 4. Invent your own use! Disclaimer: Not to be used in place of professional assistance.